They are one of America’s largest families, and they are still growing. Jenna Wolfe was in Arkansas with the Duggar Family. A new grandchild brings the head count in the household up to 26. Marcus is the family’s third grandchild. 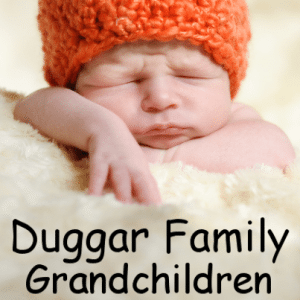 On Today, the Duggar family welcomed a third grandchild, bringing their head count to 26. A Father’s Day episode of their reality show airs June 26 on TLC. I can’t imagine taking care of even one child, but the Duggar family is evidence that learning to scale can be just as useful at home, which I think was the premise of the original Cheaper By The Dozen. Instead of black and white movies, future generations will look back on reality TV shows to see what life was like. The Duggars are adept at juggling the many needs of their large and growing family. Jim Bob and Michelle are grandparents. Oldest son Josh and wife Anna are appreciating the parenting advice. The Duggars are making it clear that they are happy to embrace their new roles, with a little less responsibility. After all, they do have 19 children of their own, whose names all start with the letter J. The house is stocked with plenty of food, and there is a cafeteria-style serving line in the kitchen, and the family does 80 loads of laundry every week. Baby Marcus is just 12 days old, but he will grow up in a large family. Josh did not say how many children he and his wife planned to have. A Father’s Day episode of 19 Kids and Counting airs Sunday, June 16 on TLC. “Children are a gift from the Lord,” Josh said of his three children so far.